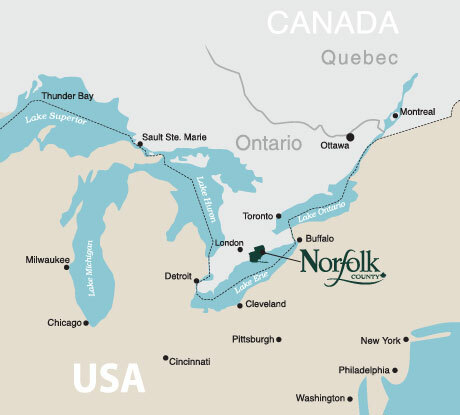 Norfolk County is strategically located within Canada and North America – less than two hours to Toronto – Ontario’s largest city. Proximity allows for easy distribution to other important markets in Canada, the United States and Mexico. Over 450 million North American consumers are accessible from this location – 152 million consumers are within one day’s drive. In particular, the advantageous location of Norfolk County within Ontario is of critical importance for on-time delivery of agriculture and food shipments into the competitive US market. Ontario is home to more than half of Canada’s food processing companies. Located near the 400-series highways, railway lines and major US border crossings, Norfolk County is an ideal place to do business.